French author; born at Epinal in 1811; died in 1858. Having completed his studies in law, Cerfberr entered the service of the government, in which he held many high positions. His last office was that of prefect and general inspector of the prisons at Grenoble. 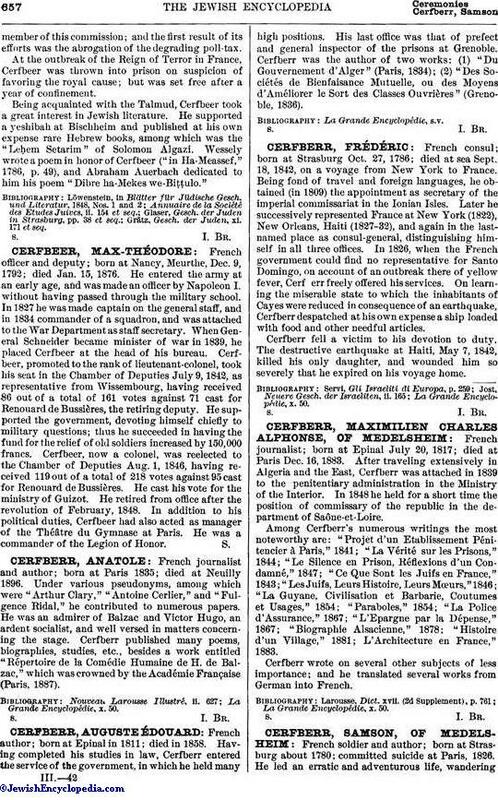 Cerfberr was the author of two works: (1) "Du Gouvernement d'Alger" (Paris, 1834); (2) "Des Sociétés de Bienfaisance Mutuelle, ou des Moyens d'Améliorer le Sort des Classes Ouvrières" (Grenoble, 1836).